Joe Saunders is expected to win his race for the Florida House of Representatives tonight, joining David Richardson, who won a decisive primary for another State House seat in August. 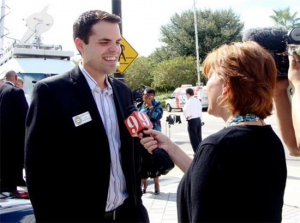 They will become the first openly LGBT candidates elected to the Florida legislature, but the state’s voters could add a third out lawmaker tonight. Gay Politics is also watching Ian Whitney’s race in Key West. “These are groundbreaking and potentially very important victories in a state with no significant statewide laws protecting its LGBT citizens,” said Chuck Wolfe, president and CEO of the Victory Fund, which endorsed Richardson, Saunders and Whitney. Saunders is one of the leading voices for progressive values in the state of Florida. For seven years, as a senior staff member at Equality Florida, he advocated across the state for policies that now protect millions of people from discrimination. Saunders’ team called the race on the campaign’s Facebook page this evening.